It has been quite a month. Apart from finishing off a few more drawings in between a few fun family events, quite a lot has been happening. 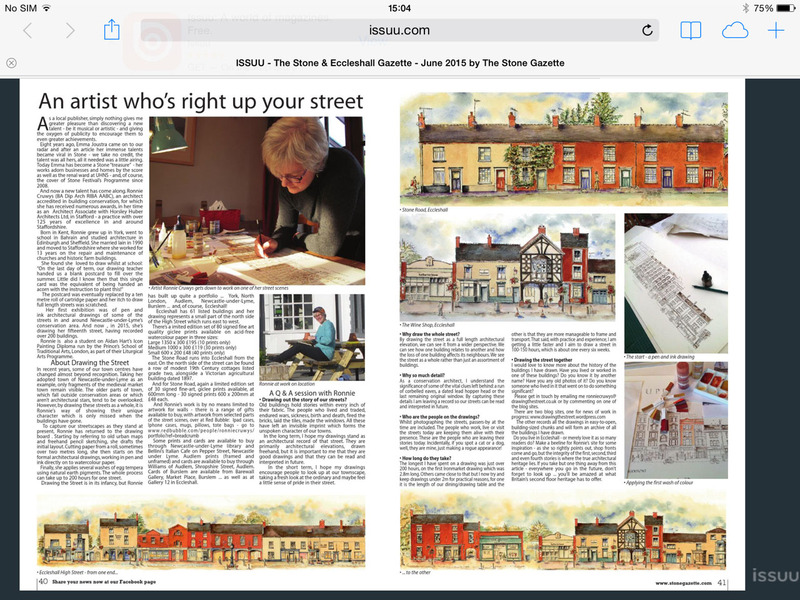 First of all, a big thank you to Paul at the Stone and Eccleshall Gazette who found my work on the web and then gave me a fab introduction to Eccleshall with his generous write up. This has been so timely and I really appreciate this vote of confidence. 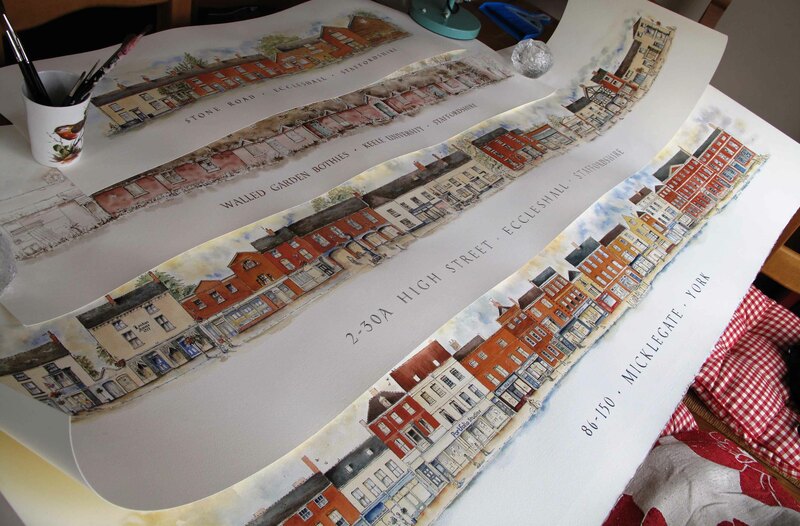 It was published just as I had placed the first framed print of Eccleshall High Street on the wall of Gallery at 12. Paul’s generous write up in the Stone and Eccleshall Gazette. 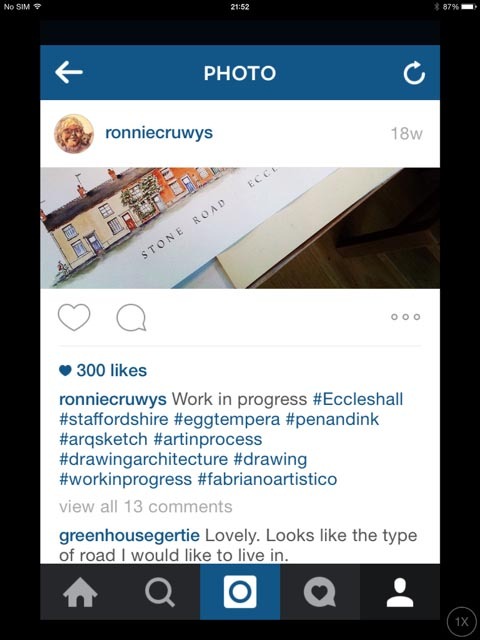 Just before this happened, my Instagram site (@ronniecruwys) took off. I have been posting work-in-progress photos for the last 9 months and have been using hashtags to connect with other artists interested in the same subjects, for instance #Eccleshall or #Drawing #Architecture. It has been great to connect with people all over the world and share stages of my work in progress. One drawing (of Audlem) got reposted on to another site and within 2 days had over 30,000 likes. Crikey. Meanwhile, Stone Road Eccleshall is getting a respectable response too. I would also like to give a big vote of thanks to my new Instagram buddies @carolineiam @daveh500 @eddequincey for pointing me in the direction of Gallery at 12, where I have since become a member, and for giving me such enthusiastic support! What’s more, I actually met @carolineiam last night in Eccleshall, in one of those wonderful moments of serendipity! So, back to the Eccleshall drawing. This is now scanned and on the website www.drawingthestreet.co.uk if you want to see it full length. No 2, on the corner is early C19. 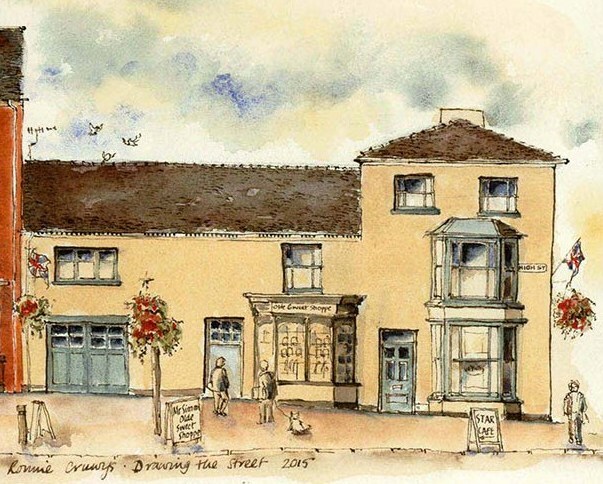 Next along is the Arcade, home of Eccleshall’s artists’ co-operative, Gallery at 12 and the lovley coffee shop The Artisan. 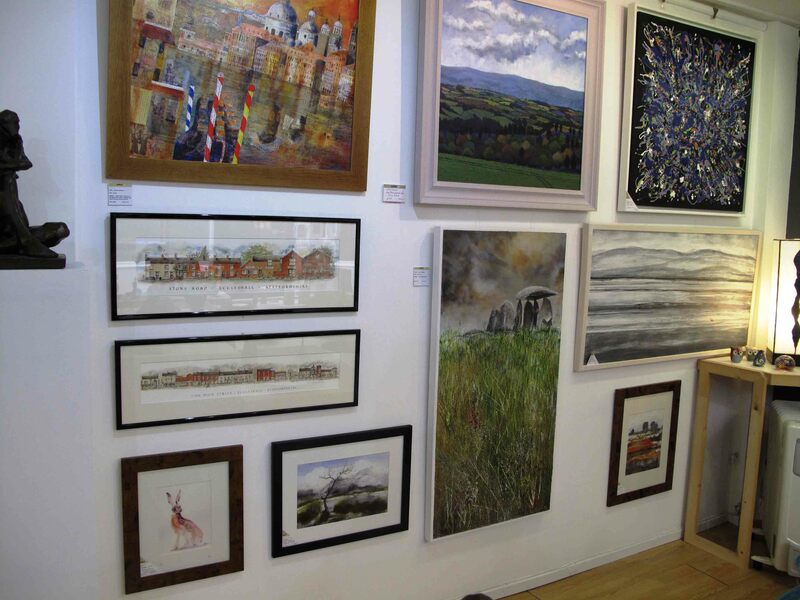 A glimpse into Gallery at 12, High Street, Eccleshall, with my first few small sized prints up. British Listed Buildings Online is a great resource for the history of our streets. The building to the right of London House is listed grade 2, early C19. London House is also listed grade 2, and probably late C17 or early C18. 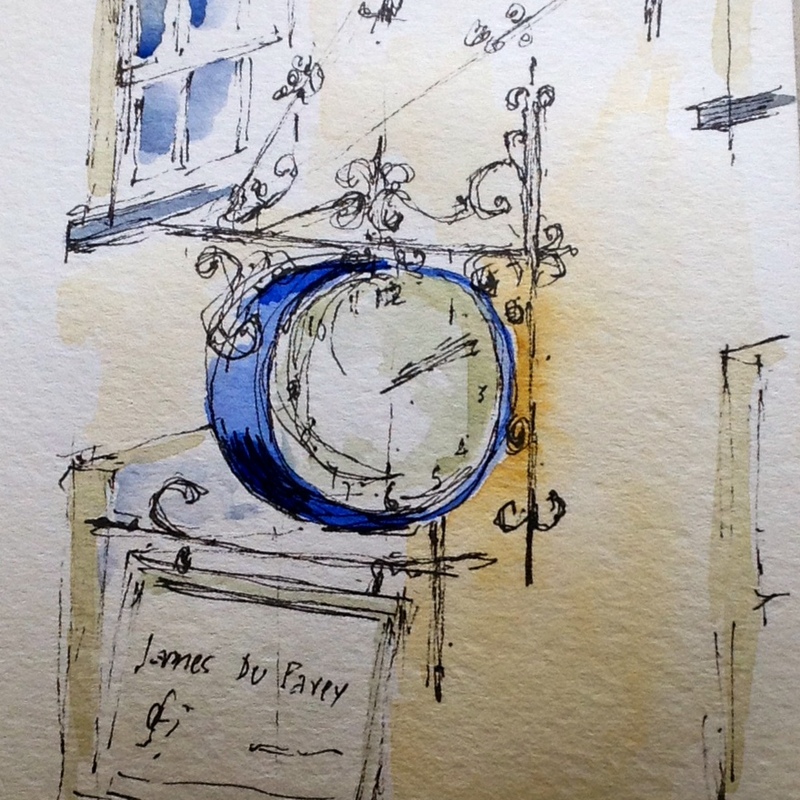 I do plan to continue with drawings of Eccleshall so please follow this blog if you would like to be kept up to date – or over on Instagram. Thanks for reading.